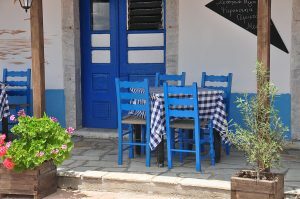 With no airport, visiting the island of Skopelos in the Greek Sporadic island chain by crewed yacht charter is one of the best ways to see this island. 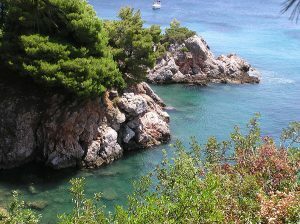 Skopelos is one of the largest of the Greek Sporadic Islands, located between Skiathos and Alonissos. 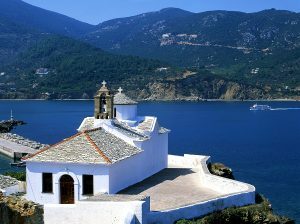 A very green island, as are many of the Sporadic Islands, Skopelos is covered with cooling pine forests and surrounded by crystal clear water with many anchorages for a yacht charter visit to this lovely Greek Sporadic Island. Supposedly founded in Greek mythology by one of the sons of Dionysus, Skopelos was always known throughout history for the production of great wines. 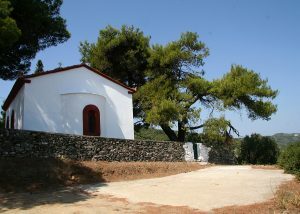 The island of Skopelos has been at different times under the rule of Athens, the Kingdom of Macedonia, Roman Republic, Byzantine Empire, the Republic of Venice and the Ottoman Empire, and throughout this history, the villagers on Skopelos were continuously reputed to produce great wines and olive oils. 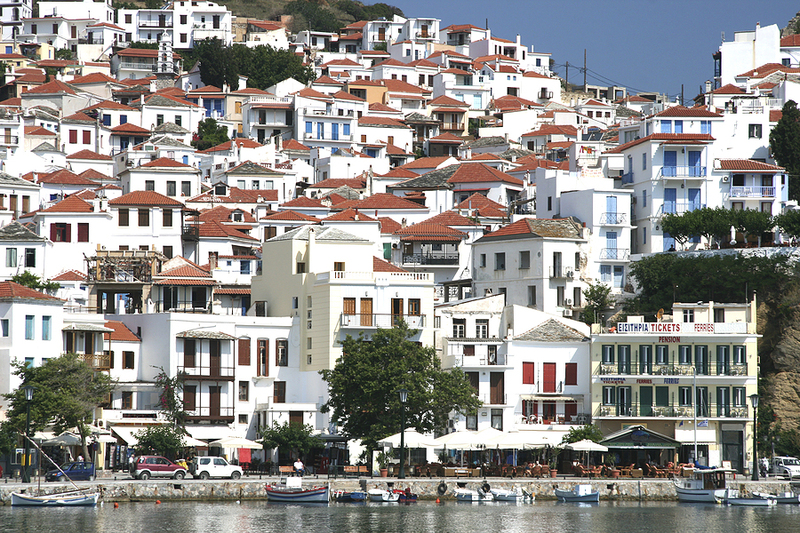 The main port, also called Skopelos or Chora, on the northern coast of the island, is a town of white washed traditional tile roofed structures with many wooden balconies, alleyways and walking streets ringing the old harbor. 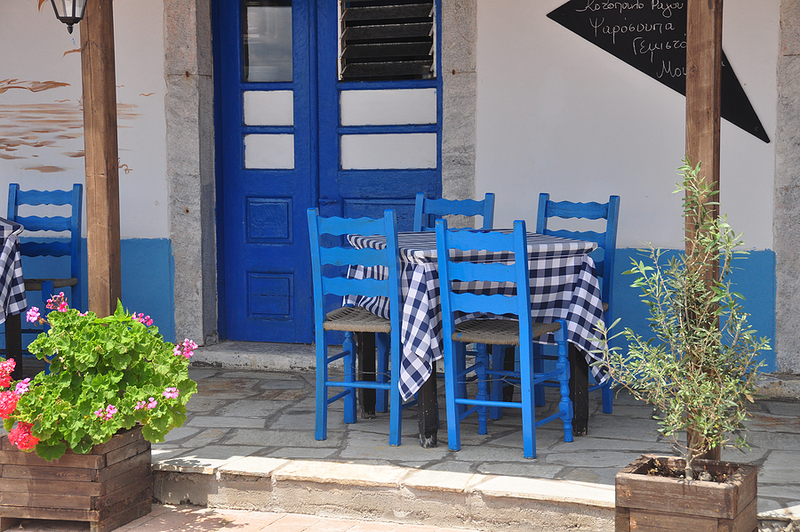 Also of note, is Glossa village on the north western tip of the island, a tranquil traditional village. 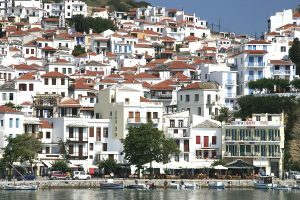 The town of Skopelos has been decreed a “Traditional Settlement”, which requires that the town maintain the traditional architectural style for any renovations or new structures, retaining the old feel of the main harbor area of this island. Along the waterfront is a tree lined promenade with restaurants and cafes shaded by plane and mulberry trees. And of course, the main harbor area is full of shops tucked into the tiny alleyways, however refreshingly on this island, there is a strong showing in the shops of local crafts including wood carving and pottery. 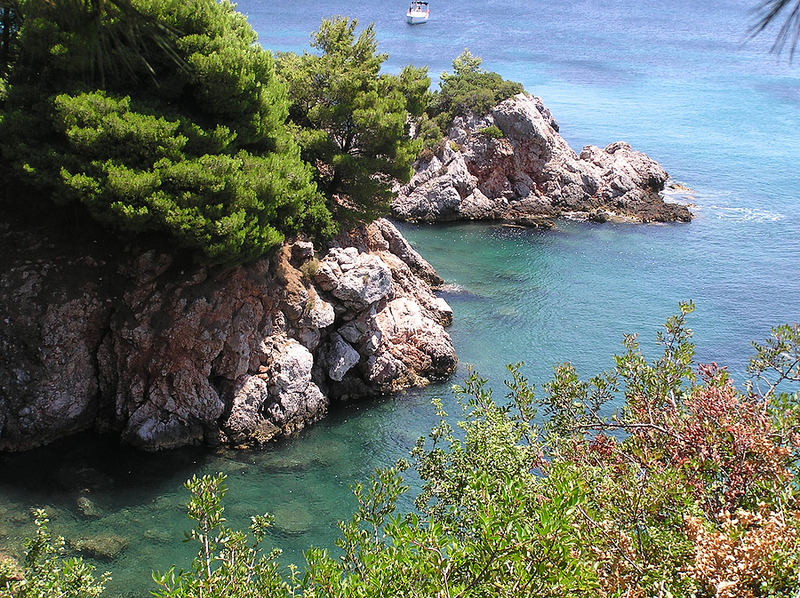 As a mountainous island with a lot of seaside cliffs, beaches are few and far between, and not all are sand, however the anchorages ringed by white cliffs, topped by green pine trees, all reflected in the clear waters below, are beautiful and tranquil and a great location for a refreshing swim. One of the few beaches that are on the island, Kastani Beach, was featured in many of the beach scenes in the recently released movie “Mama Mia”. Inland, this is a great island for exploring on foot, with beautiful green forests of pine trees, extensive olive groves, vineyards and fruit orchards, for hiking or just meandering through. Visit Skopelos and relax surrounding by greenery, and beautiful clear water on a crewed yacht charter itinerary cruising through the Greek Sporadic Islands.